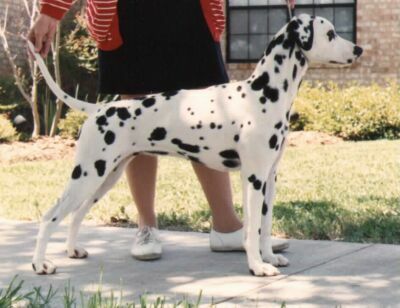 CiCi (whelped 3/10/90), dam of our Bungee, acquired her obedience title at the DCA National in 1991. She retired to Florida with the McNally family where she lived a long and happy life. We kept in regular contact throughout the years and enjoyed all the pictures and stories of CiCi’s various animal friends from cats to Basset Hounds. We lost CiCi this past September 2002. CiCi passed on her strong topline, rear, and correct tailset and carriage. Beautiful head and sweet temperament.